“An oasis of perfection next to the sea.” Those words really do sum up La Posta Vecchia, surely one of the loveliest hotels in Italy. Driving to it in the hire car after my flight (the Leonardo da Vinci is the nearer of Rome’s two airports), I was deeply unimpressed by the surrounding area, which is more suburban than I had anticipated. But once I turned through the electric gates of La Posta Vecchia, I entered a different world – a world of manicured lawns and coiffured palm trees, a retreat where marble busts of Roman emperors gaze at swaying drapes of the finest silk damask. I stepped into the main entrance and looked straight through the building to the Mediterranean. The motor was taken away and I felt that I had found my Italian home. In fact, many distinguished fellows have called this property their own. 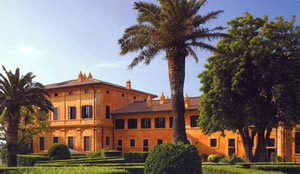 Prince Orsini built it, on the ruins of two Imperial Roman villas, in 1640. Centuries later, John Paul Getty – he of the untold riches based on oil – restored it and employed Federico Zeri to fill it with 17th Century furniture, paintings and tapestries. Remarkably, when the current owner acquired it in 1980 and turned it into an hotel, it came complete with these wonderful furnishings. 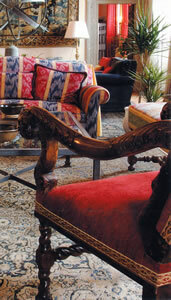 The public rooms therefore have the character of a grand private house. 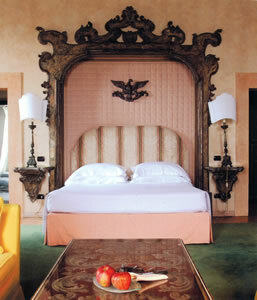 Now the hotel offers 19 rooms to guests of the most discerning sort – like me. I was soon in my apartment on the first floor. This was The Garland Room (a Superior Deluxe Sea View, and therefore 450-590 euros a night, bed and breakfast for two, depending on the season). Was this named after Judy Garland, the chanteuse who once stayed with Mr Getty? 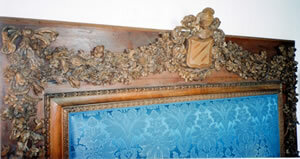 Or was the name a tribute to the riot of carved wooden garlands (pictured) over the bed? I never did discover. But what I did find out was that this was a fine billet. In the hallway was a private sa fe. The floor here, as in the bedroom, was of terra cotta tiles. At about 18 feet by 15, my sleeping quarters easily accommodated two windows overlooking the sea and an ancient stone fireplace. The walls were white and the rug was beige and the only sound was the stirring of the ocean below. (I have often wondered why we find that surging and sighing so restful. Perhaps at some deep level we are prompted to recall our time in the womb.) There was only one easy chair, but a word to the ladies at Reception and another armchair appeared within moments. This eagerness to please characterized every member of staff I encountered. 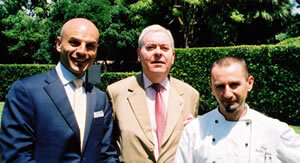 It is an attitude which marks out the great hotels, and here it is a tribute to the General Manager, Danilo Guerrini (pictured, with myself and the Chef). As usual, my back complained about the bed. But the staff rushed in with soft duvets and, very soon, my bed had grown in height and had increased to that measure of softness which affords me restful slumbers. The sea air required afternoon dozes, too, and thereafter I made it my habit to potter downstairs for tea in the gardens – iced Earl Grey in a porcelain cup, sipped as the breeze stirred the trees and provided movement for the wind-surfers far away across the blue water. 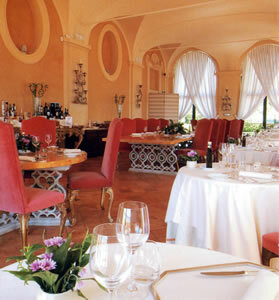 It would be possible to use La Post Vecchia for visits to Rome. 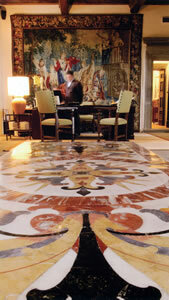 (The hotel provides a shuttle to the city centre, which can be booked.) 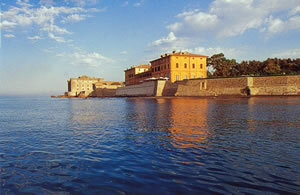 But I preferred to linger by the sea, and leave the urban bustle to those less familiar with the Eternal City. Thus did I prepare for the delights of the evening. And ‘delights’ is precisely the right word – for the hotel’s Cesar Restaurant not only occupies a terrace right next to the sea, but also offers the food of Chef Michele Gioia (pictured) – food based upon the very finest ingredients, treated with precision, skill and intelligence. 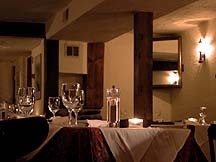 It is entirely right that Chef Gioia’s cuisine has been awarded a star by the Michelin inspectors. As the sun went upon its way and the lights across the bay began to twinkle, my evenings began as I settled myself into an armchair at a table with a beige cloth. The pianist played proper music – now a mazurka by Chopin, now Debussy’s Clair de Lune. The waiters in grey waistcoats adjusted the Spiegelau glasses and the Broggi cutlery and re-folded the napkins of guests who had left their places for a moment. Smooth, restful and civilized was the atmosphere. 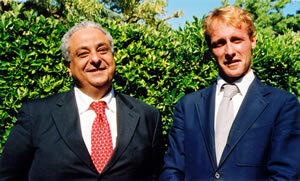 And for this I should say a word of thanks to Maurizio Figuccio, the Assistant Restaurant Manager, and to Gianni Alocci, the Food & Beverage Manager (pictured, with Gianni on the left). This was a good place to eat and to dink. Allow me to share with you the highlights of my dinners. (You should allow around 90/100 euros for four courses.) Tender lobster was uplifted by the intriguing flavours of melon, ginger and mint. Scallops were gloriously flattered by the presence of sweetbreads and crisp potato. Faggoti – magnified ravioli – of burrata cheese with tomatoes and basil were simple and delicious. Duck breast, with confit of duck leg, hot duck foie gras and parfait of duck foie gras, showed a kitchen which was not afraid of complexity and hard work. A large apple soufflé for two – made at my special request – showed also that the kitchen was at ease when moving from the confines of the menu. But my special praise must be heaped upon the medallion of veal. This was possibly the finest veal I have ever eaten – exquisitely tender and astonishingly full of flavour. It came with carrots in olive oil and sweet and sour balsamic sauce. It was a triumph. About 200 wines occupy the cellar, most of them Italian. Prices range from 28ε for an Asti Spumante to 1,800 for 1990 Lafite. Of the super-Tuscans, 2005 Solaia is 240ε, 2003 Ornellaia is 190ε and 2004 Sassicaia is 240ε. From my own drinking I will recommend to you a brilliant verdicchio from the Le Marche region – round, elegant and balanced, with pleasing notes of sherbet ( La Monacesca, di Matelica, 2007 - 35ε) – and a cabernet sauvignon from Sicily, packed with ripe black fruit (Sanrocco, 2007 - 30ε). But be careful, if left in the glass too long, like many Sicilian reds, this wine starts turning into caramel. You will notice the modest prices of these wines. 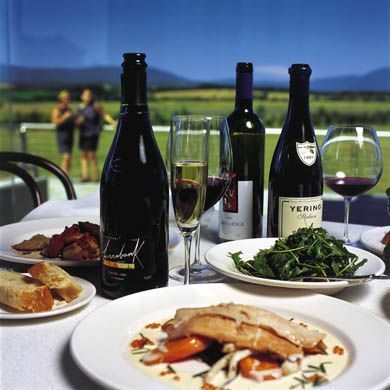 It is possible to drink very well at La Posta Vecchia without breaking the bank. On my final evening the establishment’s Mercedes took me up the coast to the hotel’s sister property, Il Pellicano, at Porto Ercole (see separate article). It had just been awarded its second Michelin star. I was greeted by the enchanting General Manager, Francesca Tozzi, and led into the restaurant to be reminded why Chef Antonio Guida’s food is so much admired. Sautéed vegetables with herbs and flowers from the hotel garden were superbly subtle; risotto with pecorino cheese and crisp pork belly was perfectly judged; pigeon breast with foie gras was gorgeously rich; and the concluding madeleines with wild strawberries were, in their judicious harmony, alone worth the journey. (These four courses were 130ε.) I returned a very happy man. 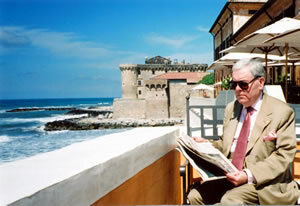 And my mornings were occasions of happiness, too, for my breakfasts at La Posta Vecchia were times of undiluted pleasure. Back on the restaurant terrace, the friendly waitresses brought to me silver pots of coffee, bowls of ice cubes and my concluding cappuccini. From the bountiful buffet I secured melon, pineapple, stewed pears, crème brûlée, crisp bacon and orange cake – all of high quality. And here occurred another example of the excellent service I enjoyed throughout my stay. Somehow – I am not usually a slovenly eater – I managed to spill scrambled eggs onto my trousers, which improved my Savile Row suit not at all. From the Reception desk was rushed the magic solution, a spray called Viava. A quick brushing later and decency was restored. 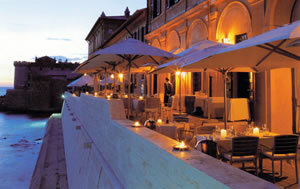 “An oasis of perfection next to the sea.” Who spoke these entirely accurate words about La Posta Vecchia? I did. And I was right. Palo Laziale, 00055 Ladispoli (Roma), Italy.